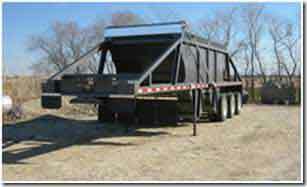 Dump trailers come in a few basic configurations: semi-trailer end dumps, bottom dumps, side dumps, pups and transfers. While regional weight and axle spacing regulations often determine the best choice for the application, you should be aware of which application each is best suited to perform, as well as advantages and disadvantages. Bottom dumps feature a clamshell dump gate on the bottom of the trailer. When the clamshell opens, it allows material to be precisely laid in a windrow left and right, or spread evenly across the rear of the trailer when it opens front to rear. There are generally three types of applications for which bottom dumps are widely used: stockpiling, material transport and asphalt paving. Contrary to common belief, a bottom dump can be an effective stockpiling tool. "When you are truly stockpiling, you have a loader or dozer actually building that pile. In this situation, a bottom dump offers a very quick turnaround time. "The wheels never stop turning. You actually drive right through that dump zone and open the gates to full open. You can dump an entire 21-yd. load in about 25 ft."
The material can then be easily handled with the loader or dozer. With cross-gate models, you can easily spread materials on roads. "We have found that driving at certain speed it will actually dump a load as wide as 16 ft. and do a nice job of laying the material our. "Each time a new dump truck backs up to that asphalt machine, it has to stop, so there is always a seam. If the time between trucks is several minutes or longer, then you have quite a seam that builds up." This can result in weak spots in the pavement. With a bottom dump, there is no need to stop the laydown machine. "It is basically a continuous flow of asphalt.